It already produces a solid 450 horsepower, but German tuner ABT Sportsline has managed to make the Audi RS5 even better. Less than a week before its scheduled debut at this year’s Geneva Motor Show, German tuner ABT Sportsline has unveiled some details about its latest project, an upgrade kit for the Audi RS5. 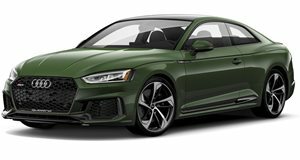 Redubbed the RS5-R, ABT began by upgrading the performance coupe's naturally-aspirated 4.2-liter V8 from 450 to 470 horsepower by adding a new exhaust system that utilizes lateral dual pipes. As a result, the tuner claims its RS5-R can go from 0-62 mph in just 4.3 seconds, down from 4.6. Exterior enhancements include new 20-inch alloy wheels as well carbon-fiber constructed items like a new hood, diffuser, front apron, splitter, side skirts and rear wing. The interior is covered in black and red Alcantara with carbon-fiber door panels. Along with bucket seats decorated in racing stripes, there are also four-point seat belts and a stainless-steel roll cage. Final pricing and additional details will likely be available next week.